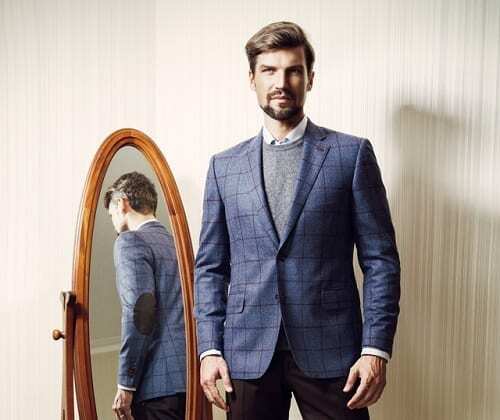 A semi-bespoke suit is always going to be far superior to any suit you can buy off the rack. Unlike basic custom or made to measure garments that often have a huge array of limitations to customisation (on everything from style to cloth), here at Steed you can get a custom suit that is closer than ever to a fully bespoke option with thousands of options for customisation. A semi bespoke garment can also be made even faster than a true bespoke garment. Fully tailored to your shape and size, Steed take over forty different measurements and a vast array of figuration details, relying on the “cutters eye” to ensure your new garment fits you perfectly. At Steed you will always be measured by an expert Savile Row Cutter – not an average tailor nor salesman. With a vast range of designs to choose from, you’ll be able to choose your ideal style as well as details like cloths, linings and buttons. Our semi-bespoke commissions are cut and constructed to your specific measurements, body figuration and requirements allowing you to select the style, fabric and personal details. These garments are tailored using many of the traditional Savile Row methods usually associated with bespoke tailoring and take 6 to 7 weeks to make. They are straight finished without a basted fitting; such is the case with our Bespoke. However, we always like to see the finished garment on each customer, and any alterations that are needed are then done “In House” in England. The cut is crucial in creating an elegant item that will leave an impression, and our cut has been developed to create a flattering appearance, while still adhering to the general principles of Savile Row and to reflect our soft, draped bespoke suits as mentioned in the House Style. Unlike many other made to measure services, at Steed either Edwin or Matthew will measure you, both of whom are Savile Row Cutters, highly trained in detailing subtle figuration details, combined with the 30-40 measurements to be taken, rather than being measured by a salesperson who has only been shown how to take basic measurements. Both Edwin and Matthew also have a lot of input regarding pattern manipulation which they relay directly to the Tailors in the European factory to make sure the fit is comparable to our bespoke.